In Windows Server 2008 R2, to define an application to be startup automatically for current user, one common way is to create an application shortcut and add it to startup folder. In Windows Server 2012, you might find you can’t find this startup folder any more. Here is the steps to find startup folder in Windows Server 2012. 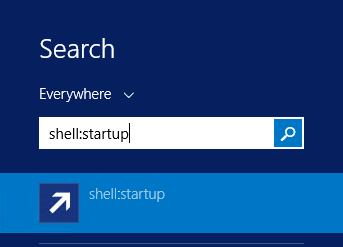 Enter shell:startup and click on the first result returned.